164 pages | 2 B/W Illus. 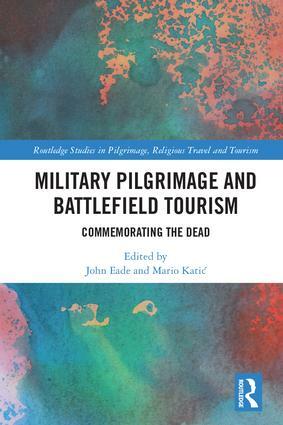 Military Pilgrimage and Battlefield Tourism is the first volume to bring together a detailed analysis of professional military pilgrimage with other forms of commemorating military conflict. The volume looks beyond the discussion of battlefield tourism undertaken primarily by civilians which has dominated research until now through an analysis of the relationship between religious, military and civilian participants. Drawing on a comparative approach towards what has mostly been categorised as secular pilgrimage, dark tourism/thanatourism, military and religious tourism, and re-enactment, the contributors explore the varied ways in which memory, material culture and rituals are performed at particular places. The volume also engages with the debate about the extent to which western definitions of pilgrimage and tourism, as well as such related terms as religion, sacred and secular, can be applied in non-western contexts. John Eade is Professor of Sociology and Anthropology at the University of Roehampton, UK, Visiting Professor at the Department for the Study of Religion, Toronto University and co-founder of the Routledge Studies in Pilgrimage, Religious Travel and Tourism series. His research interests focus on the anthropology of pilgrimage, global migration and urban ethnicity. Relevant publications include (edited with M. Sallnow, 1991) Contesting the Sacred, (edited with S. Coleman, 2004) Reframing Pilgrimage, (edited with M. Katic, 2014) Pilgrimage, Politics and Place-Making in Eastern Europe, (edited with D. Albera, 2015) International Perspectives on Pilgrimage Studies and (edited with D. Albera, 2017) New Pathways in Pilgrimage Studies. Mario Katic is Assistant Professor at University of Zadar, Croatia, Department of Ethnology and Anthropology. His main areas of interested are pilgrimage, folklore and death studies, urban anthropology and methodology of research. He is co-editor of Pilgrimage, Politics and Place-making in Eastern Europe (Routledge, 2014), Pilgrimage and Sacred Places in Southeast Europe: History, Religious Tourism and Contemporary Trends (Lit Verlag, 2014), and author of Death in Dalmatian Hinterland: Mirila from Ritual to Theatre (Naklada Ljevak, 2017).